Yesterday, we started developing an embroidery design based on a set of old Sajou monograms. Here’s the next letter in the design, and the first stage of putting the elements together. Here’s the monogram O, which is the next element in developing this design. One nice thing about monograms is that you can put them together to create simple words or full names. They’re a great way to make up an embroidery design that effectively states something. An example of using monograms as separate elements to create a whole design would be this LOVE in a Box design made from monograms. Here are the first two letters together. Now, the letters are one thing – and in themselves, they’ll be enough to create a design. But you can go farther – you can add a border, for example. Or you can separate the letters into individual boxes. 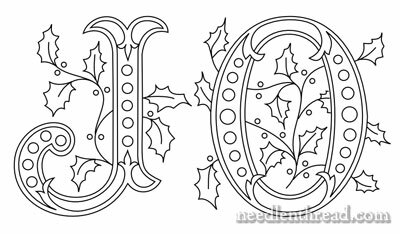 You can off-set the letters and add decorative elements around them. Lots of options, when you start playing with designs! Here, I’m just showing you the cleaned up vector line drawings of these letters. But when you’re working with a pencil in a sketchbook or on vellum graph paper (which is my favorite medium when sketching up this type of design, because it gives me a good layout grid to work on), you can really go to town with doodling, correcting, re-drawing, testing theories, and so forth! Tomorrow, I’ll give you the last letter along with some layout ideas and a printable pattern that you can use as is or develop further. I hope your day is peaceful and bright, wherever you are, whatever you’re doing! 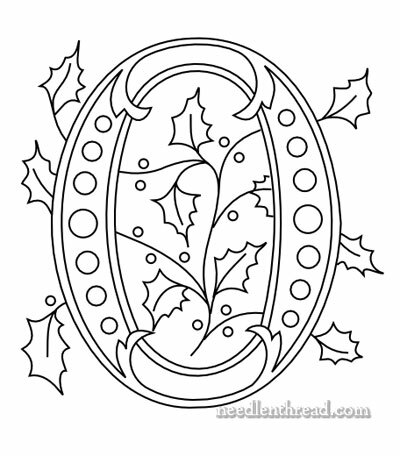 Mary, I’m not very good at drawing, how can I come up with little things to add to monogram letters (or other little motifs)? I mean to say that when I add to it you can tell and it doesn’t seem to blend so well. Just looks messy or I draw blank mentally. Do you have a ‘go to’ spot that you get some ides for that as well as the letters themselves? Hi, Heather – well, I think a semi-regular routine of doodling in a sketch book is pretty helpful. Inspiration can come from anywhere, of course, but the thing is to get comfortable with doodling things up yourself. When a seed of an idea starts to develop, I usually resort to drawing it out in a sketch book or on gridded vellum, depending on the type of design it is. It goes through many transformations, restarts, and so forth. Using vellum – a heavier tracing paper – is helpful, because you can trace the parts you like and want to keep, then move on to changing or adding other elements, without having to erase or re-draw everything from scratch. For ideas and inspiration there are plenty of design source books you can resort to, but really, ideas can come from everywhere. I’d have a hard time pinning down one source… My advice: invest in a sketch book or a nice pad of heavier tracing paper and some drawing pencils and spend a little time now and then doodling! Hi Mary, I just wanted to come and say Thank You for all the work you do for all of us, and wish You & Your Family a Merry Christmas and a Happy & Prosperous New Year. Thanks, Miriam! And a very happy Christmas to you & yours, too! I know this is going to be a beautiful Joy Monogram when you are done and I have e lot of ways to do it going through my head maybe trying to do the design with some of my first Gold work in it. I do wish you would do a whole alphabet with this style of letters.I could do so many things with this style of letters. Not that you don’t do enough for us . Happy Holidays, To you and your Family. JO! I mean YO! This is looking good. You mentioned gridded vellum in your article, where can it be found. Mary thank-you very much for all the help, instruction and wonderful designs, I’m again doing crewel embroidery, thank toy, Happy Holidays and All the best int eh New Year. Hello! My name is Fernando. I am Brazilian. I really like your blog. I went monk, currently studying to be a priest. I also do some embroidery. I want to share this page where you will find some interesting techniques of embroidery. Happy New Year! Congratulations on your great blog.